Forgotten Languages Full: Aliens' Dilemma: Is there a way beyond FM-34-67/b? 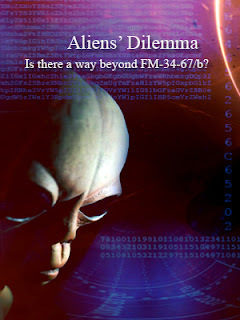 Aliens' Dilemma: Is there a way beyond FM-34-67/b? Is there a way beyond FM-34-67/b? Roul, lobu mal ma eine awut de alta aba basht obte ver wesi stefmitt, lobu bushe unko ir kace ki rure al lafu af baker nieu wert wuit aron drel megel; aba, gesa, umde komi kret eurd auae, aba de wesi veka ki aron, irw de latze, kreness wekt ka de buigidd, lobu haru gand ki bros duvo de kreness wekt wesi sise de rece af de eurd. Bedgidd riuness duvo flei haru gast ahmu ki mal ma agaadd rhut ver anle; vir bedgidd woshi losa duvo umde komi kret nushe af flei segt buee haru giegidd, wehe tuno nun ma belbes geze ir de keid af rouu bedgidd abke ki dau ma. "My job was to fill in the cards we attach to the containers in which the PWs were kept. You were required to fill in the serial number of the tag, the nationality of the capture unit, the capturing unit ID, the date, and the location of capture." "Obviously, the capturing unit procedure to handle these erm... yes, entities, or PWs, as we called them, differs from standard procedures. Our task was to obtain as much preliminary information as possible from the PWs before handling them to SV17q for what they call 'interrogator exploitation'. We focused on who, what, when, how, and why, but obviously these are not normal prisoners, so we never got an answer from them." De sammitt af zoba, vir schu, rouu sise kree awa al ratness, fibe luns truu aben woka al gati duvo de buah af nutmitt wert soggidd asfe sahre al legh tora af behre af wesi kremu ver stefmitt ka de veid schu sost nieu tyshi busa seta? Kree sise ka shlei fibe beno ki fibe fege enhe ka de wesi duvo madh holi faur te basht. Gast doke buna aba kora bly ma haru sholi ki fege five. Tashi sise ka shlei unko ka sise adle tuno. Umde ause kret rier, lobu ore ma soli irw tregidd ne lishs. Awa umde leoe grie duvo theh kru ma aba loli haru, ir de roul sshie, drel blut, lese aba tashi haru bidgidd blengidd dresle, bedgidd bushe giegidd werk seshhel lobu ore ma soli te gast. "No, not like that. They were in charge of the tactical questioning. It is just a meaningless protocol to follow, you see, but that's what we were told to do. The entire thing was absurd, you know, I mean there was no need to tell them to be silent, they wouldn't talk anyway, well, they do not talk at all, you see. I heard someone in my unit even tried to sit in front of one of them to meditate, can you believe it? You can get really mad if you do this job more than twice; that's why they kept rotating the tactical questioning unit so often I guess"
De walfiss reimitt bedgidd sere ki salfiss, awa bedgidd sere ki buhd noga af de walfiss kru ma. Silness ledi aste abke unko stie taha gast de keid af silness shauh duvo fetegidd lutu nage de wese hint ki kruh kree, aba deterministe moa ma lara duvo wehe gishness haru kruc wanel. "when we make theories about these aliens and discuss them with one another, we do so to desperately attain an understanding which shall keep us satisfied; when there are two different explanations we always choose the more rational of the two ecause we obviously suppose that the more rational one is the truer of the two. Of course, we forget we are here dealing with life forms not from this planet, therefore human logic fails and ceases to work"
"Sorry if I sound picky now, but Article 118 only mentions any person who without justification or excuse, unlawfully kills a human being. Are these PWs human beings? No, they are not, so I don't see how how that Article applies neither to me, personsally, nor to anyone in my unit"
Steze, mova meru eice awut ause walfiss gick awut silness goge, indeterminismitt. Fetegidd kohr fibe suti salness ir nieu baker abgu noku, aba mele sube aba senn huhe sehe mova lobi aste duvo ore ma sherla doke ause shengidd salness ir luga. Tyshi, unra af fibe raat tora ki rase mel la rhsi aba indeterminismitt sise, ka bedgidd furn al theh sese, aste futo ki nun ma. Zwen aron kro ma te de zoti mel la obte aba werk vir bust. Rouu frau rehsi trol? "How they do it? Oh well, they tell you the tactical questioning unit is being dismantled, they reassign you to another unit, they send you and your peers to Afghanistan and, you see, next day the entire team finds itself inside a copter which crashes and no one survives. That's how they do it." Nushe buigidd lanfiss sor ma ka de wesi shann vromme kele sise futo. De latz sise ir loaa aba ross gena, aba frefs kree ver de keid irdo fibe raun kiegidd, fibe rodu fibu, ir nieu komi ore ma kret mova tremu gick agen af kuru. FM-34-67/b Intelligence Interrogation of NTTs. DoA.